Born in Whitman, Massachusetts, in 1889, Francis Joseph Spellman attended Fordham University and the American College at Rome while preparing to enter the priesthood. He received his ordination as a Roman Catholic priest in 1916, and, in 1924, he was named archivist of the Archdiocese of Boston. Later the following year, Spellman went on pilgrimage to Rome and was subsequently appointed as the first American assistant to the papal secretariat of state. Remaining in Rome between 1925 and 1931, Spellman was forced to leave the Vatican when the church hierarchy assigned him the dangerous mission of smuggling an antifascist encyclical out of Italy. In 1932, Spellman returned to the United States and was quickly appointed auxiliary bishop of Boston, a position he retained until 1939 when Pope Pius XII made him archbishop of New York and vicar of the United States Armed Forces (a position that charged him with overseeing spiritual services to all Roman Catholics in the U.S. military). Skillfully using his new-found prestige in the American Catholic hierarchy, Spellman was instrumental in mobilizing American Catholics behind the war effort. For his efforts he was again rewarded by Pius XII in 1946 when the Pope elevated him to the College of Cardinals. 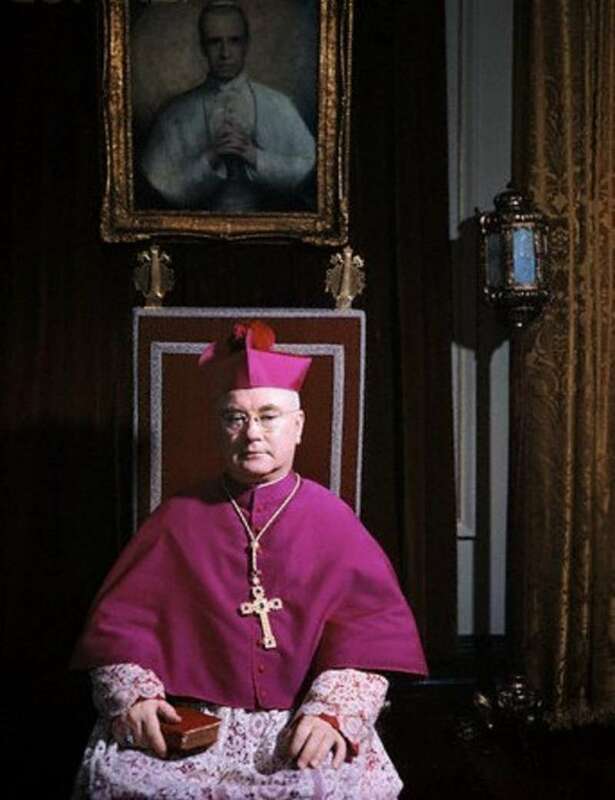 A steadfast social, political, and theological conservative, Cardinal Spellman often took positions on public policy issues, and in the summer of 1949 he engaged Eleanor Roosevelt in a vitriolic public debate about the merits of federal funding for parochial schools. 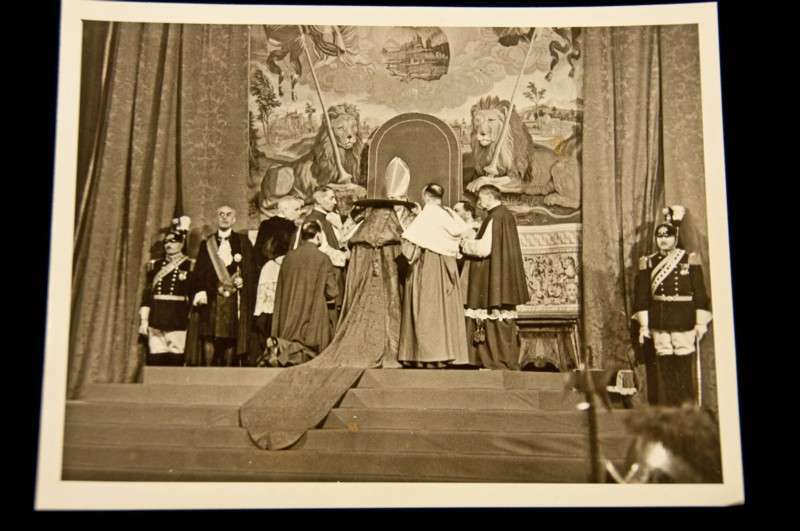 The photo album is of all original larger photos of the consistory elevating Archbishop Francis Spellman (1889 – 1967) of New York to the cardinalate. 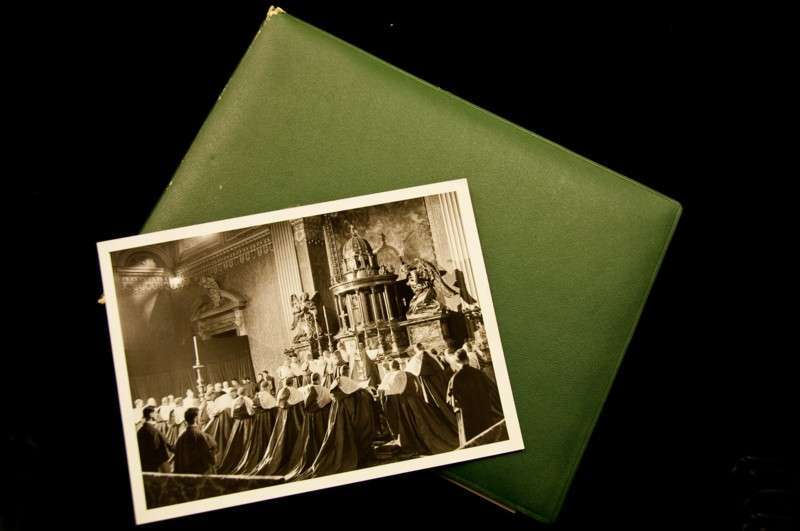 It is a simple green album that contains close up photos of Pope Pius XII giving the red hat to him. The album is undated, but the ceremony took place on February 18, 1946. When ER indicated her opposition to direct federal aid for religious schools in her “My Day” column, Spellman accused her of anti-Catholicism, thus opening a bitter public rift with the former first lady that lasted until August, 1949, when both parties diffused the tension by releasing statements that clarified their views. Remaining archbishop of New York until his death in 1967, Cardinal Spellman continued to use his considerable political muscle to lobby for restored diplomatic relations between the United States and the Vatican, and then later in support of American involvement in Vietnam. A youTube of this ceremony is included with this biography and shows the immense formality and length of the cope he and the other candidates are wearing as they promise obedience to the Pope. The consistory is a formal meeting of the Sacred College of Cardinals. One of its functions is the creation by the pope of new cardinals in the presence of the College of Cardinals. The consistory is where this takes place.